Posted on March 31, 2019 by gayle. 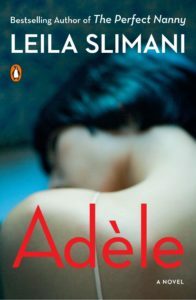 This entry was posted in Fiction, Uncategorized and tagged adele, leila slimani. Bookmark the permalink. I just finished Leila Slimani’s highly acclaimed “The Perfect Nanny” and felt very much the way you describe feeling about this one, so I wonder if it’s something about her writing. Compelling plot, yet characters who were so cold and unsettling that the experience of reading it was just uncomfortable and disturbing without being engrossing enough to compensate. Interesting – sounds like it is her writing style. Perhaps it’s also the translation?